Since having the stroke I have been limited in my posting. Hopefully I can remedy this. My doc says I should limit myself to one glass a night, i have some really big glasses. I just finished one of the nicest meritages. Do you say taje, or tije. Either way this wine was wonderful. First let’s define meritage. 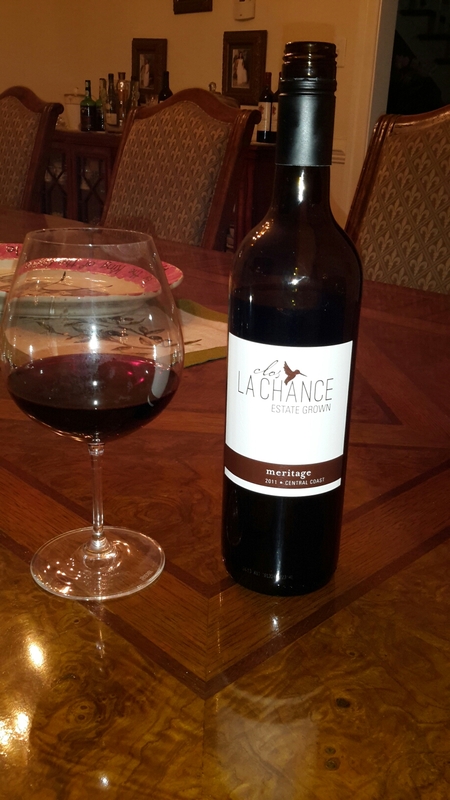 Meritage is an American blend consisting of two or more Bordeaux grape varieties, cabernet, merlot, cab franc, pinot noir, malbec just to name a few. And boy oh boy have the folks at Clos La Chance done it right. The winery is owned by the Murphy family with winemaker Jason Robideaux, and consultant Stephen Tebb. The color is gorgeous, burgundy dark and mysterious. The nose erupts with fragrances of ripe fruits and a flower garden. Cherry, currant then violets and roses. Inviting and pleasurable. The scent is so refreshing. I can close my eyes and lose myself in imaginary pleasures. Now, if your paying attention you should note that I have not even tasted the wine. That ultimate pleasure is coming. The wine hits the tongue and ecstasy begins. An overwhelming sense of joy tingles through my body. Rich flavors hit each part of my mouth, cherry, vanilla, cinnamon and pepper. The depth and complexity of flavor keeps my mind busy trying to distinguish all of the intricate nuances. Soft and silky, just enough tannin to make you beg for more. The long long finish never loses the fruit that made it spectacular.